← Can Malians trust each other? Editor’s note: It’s been one year since Ibrahim Boubacar Keita or “IBK” was sworn in as Mali’s president. To mark the occasion, a Malian guest blogger offers his reflections on IBK’s record in office and the promises he made to his people. My favorite is number 4 – military operations abroad! For a country that was unable to defend itself, the candidate was focusing on foreign operations as a key policy. Obviously, nobody in the campaign bothered to check the hurriedly written program for the relevancy of its content. Malians should have known then. To be sure, the president still has four years left to carry out programs in his platform; it would be hard to expect satisfaction after one short year. But one must admit that the country is off to a poor start. In his swearing-in speech, IBK promised certain things to Malians – They were not part of his platform (which he probably never read), but were promises nonetheless. Shortly after saying this, the president and his team went about fiddling with public finances. His personal friend Sidi Mohamed Kagnassi (later named special adviser to the president) received a dubious-looking no-bid defense contract worth 69 billions francs (approx. US$136 million) in November 2013, later raised to 108 billion francs; to help him finance the deal, the state also provided a loan guarantee worth 100 billion francs (approx. US$197 million). In effect, taxpayers were financing Kagnassi, a government employee, to become a top state contractor. Mali’s laws allow no-bid contracts for defense-related purchases to maintain secrecy, but as the International Monetary Fund (IMF) found out in their routine evaluation [PDF] of public accounts, the law was abused in this case: the vast majority of the contract was for the purchase of non-military items (e.g., trucks and open-bed 4x4s). The abuse of public finances did not stop there; as the IMF was arguing with the government on the Kagnassi contract, another no-bid defense contract worth 25 billion francs (approx. US$49 million) was being readied. The first portion, valued at 10 billion francs, followed the same technique; more trucks over-invoiced up to four times their value. To add insult to injury, this contract was signed by then-minister of defense Soumeylou Boubeye Maiga on 22 May, the day after an army unit was defeated in Kidal, and while everybody was trying to piece together what had happened; the bodies of Malian soldiers were still lying in the sands of Kidal. No sooner were these words uttered than the president began planning the purchase of his private jet – an aircraft of unknown cost, thanks to lies deployed by the state. It was claimed to be 17 billion francs [approx. US$33.5 million], then 20 billion, then 5.5 billion plus a 14.5 billion loan, then just a few days ago the finance minister said it cost the treasury 18.6 billion. We must await the auditor-general’s report due this month to really understand how much taxpayers are in for. Engaging in a vast reform program involving military training and updating equipment for national defense, the military undertook to acquire a certain number of items including a command aircraft to transport military staff. 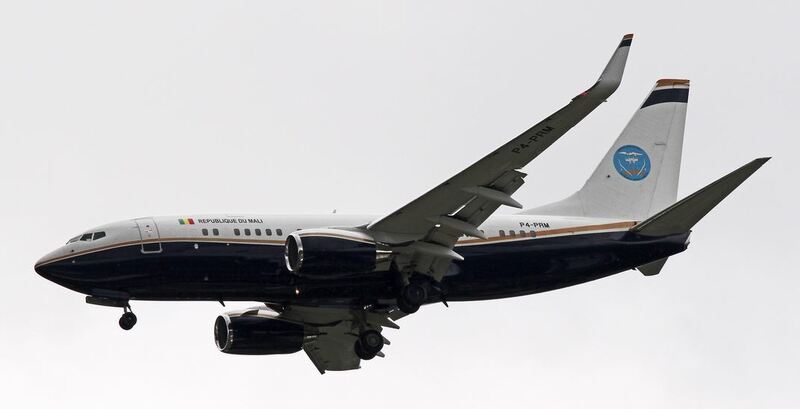 This aircraft would also serve the transportation needs of the President of the Republic, whose current travels pose significant security challenges due to the rental of private planes and the changing of aircrews. How our army suffers! All sorts of messing around is carried out in its name. The finance minister claimed the airplane was a military command aircraft; a command aircraft with bedroom, office, living room and a shower. Mali already had a presidential jet acquired by the previous president. In an open session in parliament, Prime Minister Moussa Mara objected to the use of that airplane because it was… owned by the military. The newly acquired jet is registered in Aruba and supposedly leased to a third-party; that contract has never been published. The opacity surrounding its purchase – well, it’s a military airplane that needs secrecy – has alarmed the IMF, which is asking for an auditor’s report. Nobody is above the law – except people who participated in crimes in the north. The victims are just that, victims to be forgotten with no right to presidential tears. People were stoned to death, hands were amputated, women raped, and peaceful citizens simply killed for nothing. The rebels who had been imprisoned were freed from the custody of the justice system and simply asked to go home. Abuses carried out by elements of the armed forces have also been swept under the rug. As we have seen, you have to watch out whenever the president says “Let no one…” – you’ll be disappointed if you take those words at face value. There are clearly two types of Malians: those IBK has disappointed, and those whom he will disappoint. Mali’s secured territory is shrinking by the day; people living in the north no longer dare travel outside of their towns. They were the first to be let down. The armed forces were equally let down. Now, civil servants and merchants are unhappy. It seems everybody will get its turn – it’s one of those presidential inshallahs. Ask the people of Kidal, Menaka, Anefis, Tessalit, Tinzawatène, Tessalit, Ber, etc., if they see the Malian flag flying anywhere, or to whom they’re paying taxes. IBK appointed sub-prefects to the north less than two weeks ago. They can’t take their posting because the government has no control in the north. The president likes to use Latin expressions. One Malians are using today is fecimus iniuriam electio – “we made the wrong choice.” The disappointment is overwhelming. We want our money back. – A. Karim Sylla is a blogger who writes often on the MaliLink distribution list, where he posted an earlier version of this text in French on 4 September. Scoring against oneself like in footbal, “yabé”, is the bitter feeling of most of the average malians. We feel having elected a man who lost no time to cheat us. The most shocking of all is the state of our democracy. Can one talks of a democracy in a country when the President decides to take-over the parliament ? His own son, with no experience, is the head of the defense commission of the parliament. And worst, he appointed the father-in-law of this latter, speaker of the same institution. His cabinet is full of his wife’s relatives. Betrayal is the dominant feeling among malians at the end of the first year of IBK in office. Let’s hope he is going to change. This is disappointing to say the least. Malians deserve better. But as a thought, where does IBK rank relative to leaders from other West African countries? Is he much worse? Interesting question–I’m not sure how such a ranking should be assembled, but I also don’t think Malians care much if their head of state is less bad than (for example) Guinea-Bissau’s, or not as good as Nigeria’s. The criteria by which they judge their leaders are mostly absolute rather than relative. So another case of cleptocracy. Why is it so impossible to find a good leader in Mali? There must be someone, right? I had hopes for Cheikh DIarra but dunno if he was a badass, too. Or perhaps not corrupt enough, so he had to go? Who’s the best leader in Malian history then? Anyone who qualifies? IBK has to go. The country needs to be re-organized, the idea that a vast territory can be governed from Bamako when the government is so weak is a no-go. And why can’t the IMF just say no? German sociologist Robert Michels called it the iron law of oligarchy. The internal logic of oligarchies, and in fact of all hierarchical organizations, is that, argued Michels, they will reproduce themselves not only when the same group is in power, but even when an entirely new group takes control. Thanks for posting. How disappointing that IBK is letting his country down in so many ways. Please, I wonder where to find the French version of Mr. Sylla’s text. On MaliLink, 4th of September, I didn’t find. Can I ask himself?